A square number or perfect square is the product of some integer with itself. For example, 25 is a square number, since it can be written as 5 × 5. 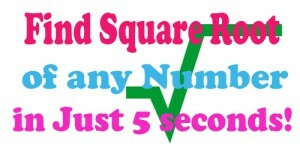 To Find square of a number, just multiply it by itself. 3.5 × 3.5 = 12.25—Close, but not close enough! 3.465 × 3.465 = 12.006, close enough! Example1: 6 × 6 = 36, so a square root of 36 is 6. 1. We can also square negative numbers. Watch the video below to learn some quick tricks for calculation of square root.